It is a relief to see this morning that many of our all-too-close neighbours are packing up, particularly as we are planning to stop for one more night. We're due to be joined by David Kitson this lunchtime and I feel rather surreal about his impending arrival. Why? David is the real deal, he's almost 10 years younger than myself and he's already travelled right around the world on two wheels. This is the first day of what he hopes will be a tour of Europe around The Baltics, down to The Balkans and on to anywhere else that takes his fancy. I fear I may be envious but he's a nice bloke so I'm looking forwards to his presence. Before he arrives Sharon and I take a stroll out of the campsite along what I suppose is a dyke. Some houseboats grab our curiosity as they are something I can't recall seeing in the UK, although I sure there are some. There's also a lagoon with a marina and heron's patrol the shallow waters close to the dyke. Other than the body of water the motorway bridge looks like any other as do the office buildings and pylons. Hang on, that's just a static on a floaty thing isn't it? Motorway bridges all look the same, even Dutch ones. Back at the campsite there is now space to breath. Impressively on this Sunday morning the team of staff are scrubbing and hosing down every inch of the toilets while others brush the yard and collect litter. I was disappointed upon arrival, now I see just how much effort goes into this place. I make a note to myself, be somewhere quiet at the weekends - preferably not the city. Fair play to Camping Zeeburg though, they run a busy but a tight ship. David doesn't carry any air of "I've been further and done more than you". When he's not off roading across far away dirt tracks he works as a chippy (joiner/carpenter) on building sites, he talks and comes over like any other working lad. He occasionally throws in comments like "...and when I was in Peru this other biker said..." in the same way I'd mention my mates at the bike club. David finishes putting up his tent on the lush green grass with a smile. After he's put his tent up on the newly available spaces we head into Amsterdam via the Tram. The bikes? Hell no, I have no desire whatsoever to even contemplate actually trying to ride a motorcycle into the centre of town, negotiating the suburbs yesterday was more than enough for me. Between talking to David I glance out the windows and at Amsterdam's outskirts. Yeah, yes, it's a city and it looks like all the other cities I know. Sharon points out one difference beyond the number of cyclists, it is cleaner than most. She's right you know. Pretty? No. Clean? Yes, Sharon raises a good point. It's only as we get into the centre do we start to see Amsterdam as seen in brochures and promotional websites. Oh yes, tall thin houses, the odd square, plenty of canals and cyclists...thousands and thousands and thousands of cyclists. The environmental benefit of Amsterdam's obsession with the bicycle must be huge! A gazillion journeys every hour all completed without burning any fossil fuel and every rider just that little healthier due to the exercise and cleaner air. It is a commendable demonstration of a modern green and clean transportation system that truly works. Ah yes, the town centre is more akin to that which I was told to expect. Unless you are a gawking lost tourist, like myself. "KERCHING KERCHING!!!" The bicycle bells ring all around you and riders clip your elbows as you stand in what you thought was a footpath. It is, the cycle lanes are overflowing and the cyclists assume right of way on the pavement too. Bicycles are chained to every available railing, some are chained to bicycles chained to the railings, some are left in the middle of the path and others just lean against a lamppost. The famous cafes where you can buy marijuana look just like...cafes or bars. I don't know what I expected but I need to learn to manage my expectations. The little piece of the red light area we see consists of a narrow lane, barely wide enough for 2 people to pass, with the odd glass doors along it's length. Behind the smoked glass doors stand very attractive young ladies in lingerie or bikinis, posing, and...that's it. Again I really must learn to manage my expectations. I am indeed very impressed by the...er...ladies behind these doors but with Sharon behind me it seems a little blunt to stand and stare. Honestly? If you wish to look at pretty ladies in lingerie then save yourself from being run over by a bicycle and the cost of weekend in Amsterdam and use the internet. If however you feel the need to touch rather than look then that's your choice. 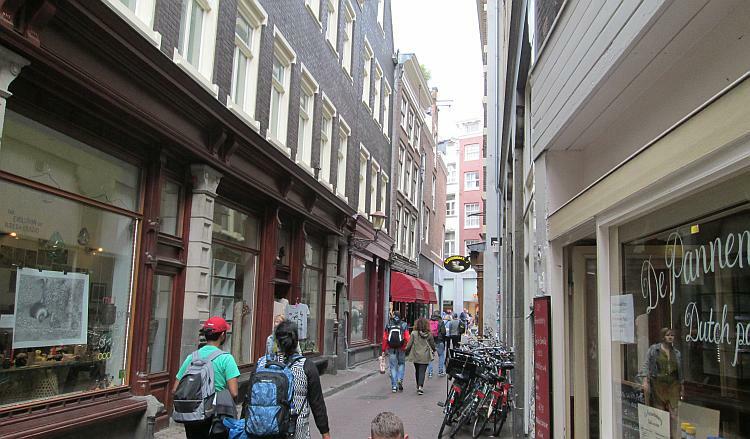 Ann Frank's hiding house seems to have lost any sense of the dignity that her tale deserves. It is a tourist attraction with a queue of people waiting to pay to go in and lots of students looking bored to tears outside. The side roads and back streets do offer some kind of individuality and character with their uniform narrow style yet each retains it's own uniqueness. 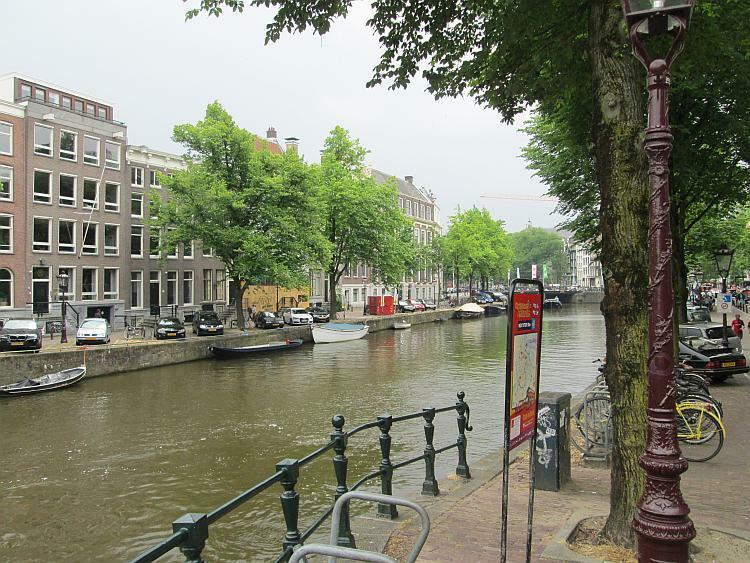 Everyone seems to have a waterfront view as canals and waterways work their way into every nook and cranny. Right here in the centre of the city Amsterdam does have enough differences to make it feel different. There is a character here, and bicycles, lots of bicycles. As David leaves us to go and share a drink with some chap he met in Vietnam (rub it in Dave, rub it in) Sharon and I indulge in some of the local cuisine...a cone of chips. I don't like cities but I've made the effort and I really do want to make a concerted effort to appreciate Amsterdam. We discuss taking one of the tourist boat trips. This gripes a little as I don't want to see the tourist version of Amsterdam, I want to make my own mind up. However there's no substitute for local knowledge and before I have chance to change my mind we're sat aboard one of the many big-windowed tour boats. A recording in Dutch then German then English then French comes over a speaker to inform us of the old market building, the church and various other points of interest. Cheesy, touristy and naff? Yeah and I do not to appreciate it, what with me being a real tough adventurer and all that. That's a lie, the thing is I do appreciate the information. Oh right! 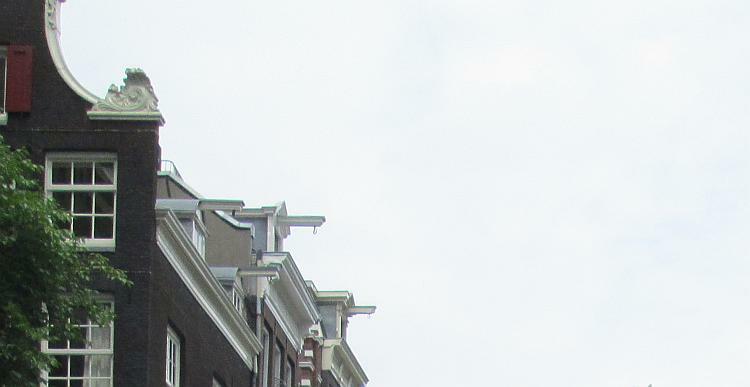 I never noticed the hook at the top of the houses so furniture can be lifted in through a window. I have apologise to the ego-driven "wild adventurer" inside me but I must admit I am just another tourist. Oh yeah! The recording is right you know, the houses have provisions to hoist up heavy stuff like furniture. It is Sunday evening, the shops are all open and the high street looks as busy as any Saturday afternoon. I guess the Sunday trading laws are different here. However Sharon and I have seen as much as we need to see so we find a tram that will take us back to the campsite. There's no sign of David all evening, I guess he's climbed inside a bottle or two and will be having a jolly time with his friend. Good for him I say. The rest of our evening is spent making use of the WiFi to upload pictures and bother folks on Facebook. I'm also looking online to see what our next move should be. North? South? East? West? I am considering a new tent. This one is only 3 years old but it's seen some action. The pressing problem right now is I keep on breaking the super lightweight and (allegedly) super strong aluminium poles. This is very annoying but manageable as I have spares and replacing them is not so bad. I say I have spares...unfortunately I left the spares at home. I really really really must get some spares as if one breaks we could end up with a very uncomfortable sleeping situation and that will not please Sharon. There goes another tent pole about to split. Argh! I've been looking at the Nigor tents, particularly the teepee style ones. They're light, easy to erect and with one big solid pole rather than several smaller flimsy ones I hope they're less likely to break. Nigor is expensive though and I ain't shelling out over £500 for something until I've seen it in the flesh and there's none on display in the UK I can find. 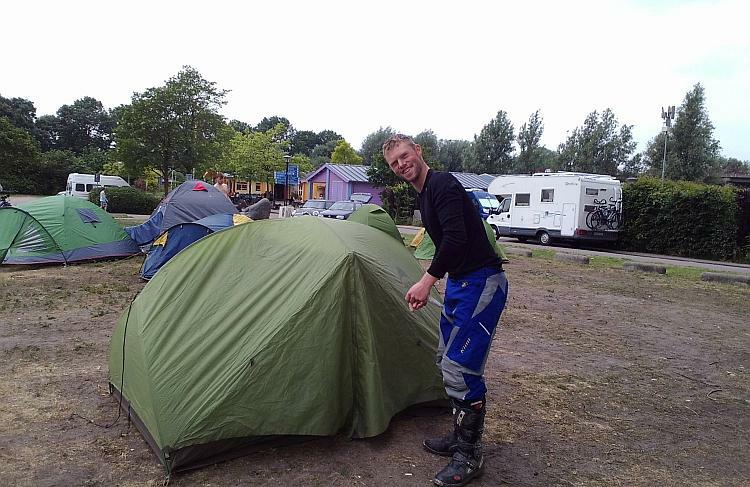 Luckily though Nigor is a Dutch company with a shop in Utrecht, some 20 or 30 miles from this very campsite. It's almost like I planned it - hehe! So tomorrow Utrecht then on to somewhere else as yet undecided. My heart sinks at the thought of having to leave the safety of the campsite and venture into the baffling realms of the Dutch road system. I hope tomorrow's ride will not be as complex and mystifying as yesterdays.